I am extremely lucky. The work I do has taken me to many places in the world and allowed me to meet some very interesting people, do interesting work and see spectacular places. Seeing La Traviata at Sydney Opera House in February 2007, being given a tour around the ESA control room in Darmstadt by the men responsible for missions to Mars and the Moon two months later, meeting the then president of Taiwan in 2004 and so on. But Friday 13 March 2009 still stands out as a day of privilege and 'how the heck did I get to be here?'. 20 years earlier in March 1989 (the exact date is unknown), Tim Berners-Lee sent a memo to his boss, Mike Sendell, at CERN called Information Management: A Proposal. Famously the comment came back 'Vague but exciting.' This is the point at which one often sees written a phrase like 'the rest is history' which covers up the efforts that Tim and his colleagues made to say, no, look, this idea of giving hypertext documents unique identifiers and linking them over the Internet really is worth following up. In June 1990 Tim named his project the World Wide Web. 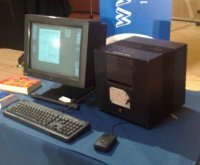 The NeXT computer on which Tim developed the Web. Incidentally, this is a NeXT computer - an advanced one for its age built by Steve Jobs. Tim uses a Mac to this day. 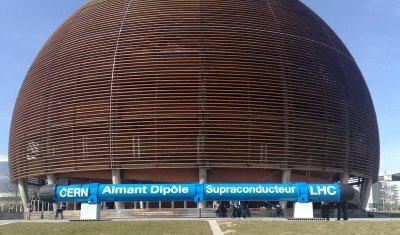 So the event at CERN was held to mark that work and to bring Tim back together with the people who supported the effort. Many of those people were there. After an introduction from Professor Rolf Heuer, Director General of CERN, we heard from Ben Segal, a computer engineer working with Tim at the time and someone who instantly 'got it', Jean-François Groff (the first technical student of the project and the very first Web entrepreneur), and the man whose name most often appears alongside Tim's when the inception of the Web is mentioned, Robert Cailliau. As Alexander Graham Bell needed someone to phone, Tim needed someone to surf the Web - Robert Cailliau was the first to do so. Listening to all those speakers makes Tim's invention all the more remarkable. Yes, all the pieces were in place - the Internet was there, hypertext already existed and so on, but it really was Tim's unrivalled intuition that put it all together (and this in an institution that employs an awful lot of very bright people). The key invention that makes the Web work is the URL: http://www.cern.ch, for example. That odd sequence of characters that allows me to be absolutely certain that http://philarcher.org/www@20/ identifies this document. The Globe of Science and Innovation building at CERN in which the meeting was held. Tim talked about those times in his usual, open way. My work means that I've met him many times and now have the honour of working for the organisation he heads (W3C) and despite all the plaudits, honours and praise, I've never detected the slightest air of superiority or condescension. He is as passionate about the Web as ever, and whilst he cannot but be its figurehead, he is still working on it daily. In June 2007 he was awarded the Order of Merit by the Queen. This is the award that can only be held by 24 living people at once and its previous holders include the likes of Winston Churchill, Isaac Newton and Michael Faraday. On the day this become public he was answering a regular question about Semantics on a public mailing list. To see and hear Tim talking about the Web: past, present and future, covering much of the subject matter discussed at this event, see his recent TED Talk. The view outside the meeting building that day. Mont Blanc is in the centre of the picture. Earlier that day I'd been equally lucky to be given a tour of CERN itself, visiting two of the four experiments that make up the Large Hadron Collider. The LHCb is an experiment to answer the question "why was the universe created with so much more matter than antimatter?" 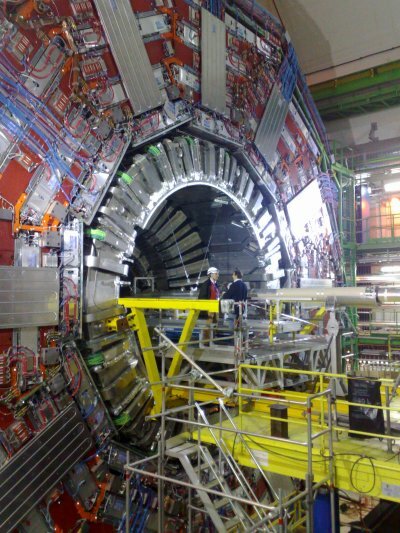 And the Compact Muon Solenoid (CMS) is where they're hunting the Higgs Boson. 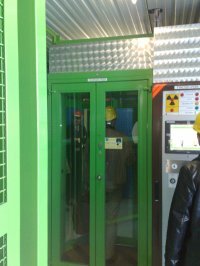 To get to either you need to go through secure, one at a time, doors and then descend 100 metres underground. Then you find yourself in vast caverns full of engineering that leaves you in no doubt that you are looking at one of the pinnacles of human endeavour. It would be like standing next to Apollo 11 before it took Neil Armstrong to the moon, or being in the room when Mozart wrote the Lacrimosa for his Requiem. I've included some photos here. They're not brilliant (but not bad given that they were taken with my mobile phone) - but no picture can possibly convey the sheer size and physical presence of the machines. All those wires? Each experiment is a set of detectors arranged around the point at which collisions will be made to happen. Some detectors are very close in to the centre and are surrounded by a magnetic field of about 4 Giga Tesla (er, that's a lot) generated by super-cooled magnets. These will detect the sorts of particles that exist for time-spans literally measured in nano seconds (a nano second is 0.000 000 000 1 seconds). Other particles may last longer and travel further out into the bigger detectors and so on through the concentric circles around the central collision chamber. Each detector is connected to the computer system, the first job of which is to sift through the data and decide what to keep. Don't they keep all the data? No, that would be very difficult and ultimately pointless. When running, there are 40 million events per second, most of which are well understood and we simply don't need any more recordings of it (think of them as Vivaldi concertos - when you've heard the 4 seasons as music on hold down a phone, you really don't want to fill your iPod with the other zillion clones he wrote). They can store data on about 100 events per second so the first 'trigger computer' - actually banks of computers - has the task of deciding which 100 to choose out of the 40 million. Every second. We're talking petabytes of data (1015 bytes or the next one up after Tera byte which is the one up from Giga byte. OK?). Our guide at LHCb was the man responsible for that computer system. One runs out of superlatives when talking about the LHC. All I can say is that they do tours every day and anyone can go. If you get the chance to do so - do so. My overwhelming emotion that day was one of humility and gratefulness to those who made it possible for me to be there. I truly am very lucky indeed.